ESPOO, Finland, June 24, 2017 (ENS) – A unique demonstration plant in Finland has proven that carbon dioxide (CO2) can be taken directly from the air and used to produce renewable fuels and chemicals. 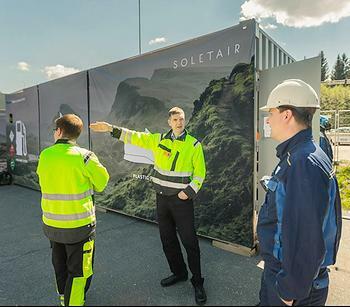 The Soletair demo plant developed by the state owned nonprofit VTT Technical Research Centre of Finland and Lappeenranta University of Technology, LUT, is coupled to LUT’s solar power plant in Lappeenranta. The aim of the project is to demonstrate the technical performance of the overall process and produce 200 liters (211 quarts) of fuels and other hydrocarbons for research purposes. This is a one-of-a-kind demo plant in which the entire process chain, from solar power generation to hydrocarbon production, is in the same place. The demo plant is made up of four separate units: a solar power plant; equipment for separating CO2 and water from the air; a section that uses electrolysis to produce hydrogen; and synthesis equipment for producing a crude oil substitute from carbon dioxide and hydrogen. The researchers say that although humans must stop burning fossil fuels by the 2050 to control Earth’s rapidly warming climate, this process can supply in a sustainable manner the hydrocarbons humans will still need. “The concept we are exploring is an example of how the chemical industry could be electrified in the future. The burning of fossil fuels must end by 2050, but people will continue to need some hydrocarbons,” said Professor Jero Ahola of the Lappeenranta University of Technology. 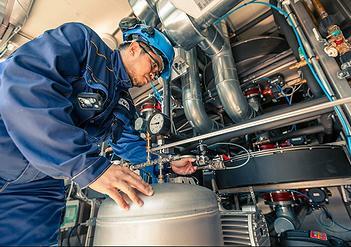 VTT and LUT will test the Soletair demonstration plant during the summer. After the pilot phase is complete, synthesis units will be used in a number of European Union projects over the next few years. “The result will be multi-sectoral industrial integration. Finnish industry’s expertise in this area is being reinforced by collaboration,” said principal scientist Pekka Simell of VTT, who is in charge of coordinating the project. Pilot-scale units have been designed for distributed, small-scale production. Production capacity can be increased by adding more units. The Soletair plant will provide a platform for conducting research with international companies. Information gathered during the project will be useful for the commercialization of the technologies. The scientists foresee new business opportunities arising for companies, such as those benefiting from the carbon circular economy or surplus electricity, or for chemical companies. VTT and LUT have invested one million euros in the equipment. The research is being funded by Tekes and a number of companies: ABB, ENE Solar Systems, Green Energy Finland, Proventia, Hydrocell, Ineratec, Woikoski, Gasum and the Finnish Transport Safety Agency (Trafi).